A woman whose loyal pit bull stood guard over her at the scene of a fire last month is charged with arson, according to Prince George's County Fire. 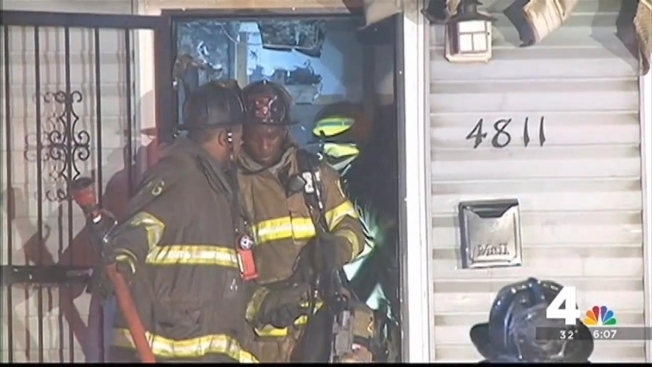 Officials from the fire marshal's office investigating the early morning fire Dec. 2 at a home in the 4800 block of 66th Place in Landover Hills discovered evidence of an unreported fire about 8 p.m. the previous evening. April Newell, 34, is charged with arson and malicious burning in that fire. According to court documents, after an argument with her son, Newell allegedly went into his room and set some of his clothes on fire. Her son put the fire out and left. Newell was arrested Thursday and is being held on $500,000 bond. Prince George's County Fire spokesman Mark Brady said Newell was photographed the next morning lying, apparently unconscious, in a neighbor's yard with her pit bull Precious guarding her after she fled from the burning home. "Little did we know at that point when the picture was taken that the female that the dog was guarding would soon be charged with arson," Brady said. Authorities said they believe Newell was faking her injuries. When her father got out of the burning home, his daughter was already outside and told him she didn't do anything, according to court documents. Newell's father suffered burns and was taken to a hospital for evaluation. Precious ended up at an animal shelter with her puppy, Molly, because of Prince George's County's ban on their breed. The next day, Precious and Molly found a new home with their owner's sister, Megan Sanchez, who lives in Montgomery County. But Sanchez and her family soon found they were unable to care for Precious or her puppy. They were able to re-home Molly, but Precious was left without a family. That's when a friend contacted Jessica Stuby and her organization, Babes 4 Bullies, for help. Precious stood guard both inside and outside during the house fire. Stuby said Precious has been amazing companion since she began fostering her. Precious suffered from smoke inhalation as a result of the fire and also had fleas. Stuby said she wants to give Precious time to recuperate and will focus on finding her a home in 2016. Precious made headlines for her act of devotion, and firefighters said they had trouble getting to her owner because the loyal dog was standing over her. Precious stood guard over her injured owner as firefighters worked to extinguish a fire at their home Wednesday morning. Firefighters tried to call Precious away, but she wouldn't budge and acted aggressively when they approached. They eventually deployed a powder fire extinguisher in her direction, causing Precious to run away and giving them time to get the woman onto a stretcher. That fire remains under investigation.